The new XL benefits from all the tried and trusted features of the HydroTilt. A well thought out, effective design which is simple to use, it is perfect for those with increased body weight and physical size. The three back options offer considerable flexibility. The waterfall back can be easily reconfigured to comfortably accommodate a gluteal shelf. 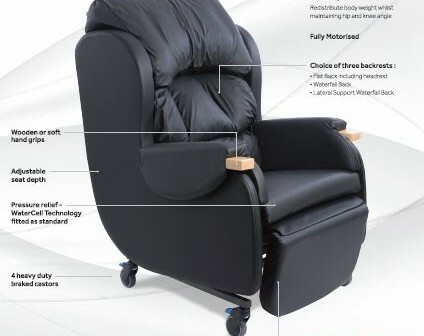 As usual with CareFlex chairs, many features are included as standard including WaterCell Technology for maximum pressure relief. 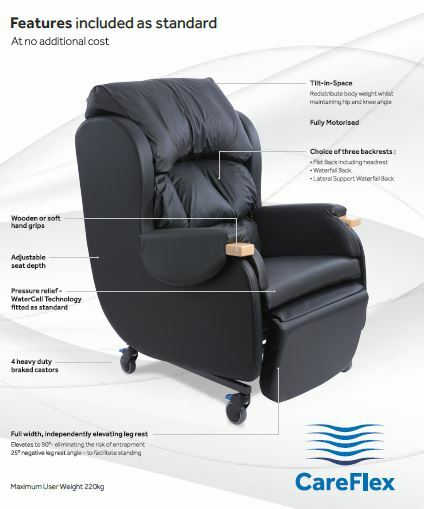 The powered Tilt in Space and leg rest elevation ensure effortless adjustment by the client or carer. The HydroTilt XL has a maximum user weight of 220kg. The internal seat width – 600 – 650mm.